Posted under Health Guides. Updated 1 May 2018. Test anxiety can cause physical symptoms such as: fast heartbeat, headaches, and stomach aches. Feeling anxious because you didn’t study is not the same thing. Relaxation techniques are helpful in controlling test anxiety. You’re about to take your mid-term and suddenly you can’t remember what you studied. Your hands feel sweaty and your stomach begins to hurt. 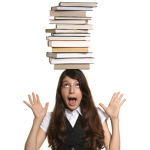 Do you have a bad case of the jitters, or could you have test anxiety? Feeling stressed out or nervous before a test is normal. In fact, some stress helps to motivate people to study, but if you get so stressed out that you’re unable to stay focused enough to answer test questions, it’s a problem. Test anxiety is a feeling of tension or pressure before a test. For example, you might feel nervous right before or during a test even though you’ve studied for it. You may feel so anxious that you have physical symptoms such as: nausea (feeling sick to your stomach), a headache, and feeling like your heart is pounding, and/or sweat a lot. These feelings can be mild to strong. Test anxiety is not the same thing as flunking a test because you didn’t study for it or because your mind was on something else, such as a breakup with your partner. Test anxiety is more about not being able to concentrate on the test because you’re nervous and/or stressed about taking the test itself. The feelings that go with test anxiety are very real, and can get in the way of getting good grades. Who is at risk for getting test anxiety? Anyone at any age can get test anxiety. However, people who tend to worry a lot get stressed out easily, and those who want to get “perfect” grades are usually at a higher risk. How can I prevent getting test anxiety? Test anxiety is caused by being stressed out and thinking that negative things are going to happen. A study done at the Southern Illinois School of Medicine found stress management techniques such as deep breathing meditation (DBM) can be helpful especially for students with test anxiety. Learn how to manage your time, not just for the test, but for all of your assignments. Get organized. This will help you feel in control. Go to review sessions and/or meet with your teacher/professor to find out what you should focus on for the test. Finding out what information is not important to remember is also helpful. Make flash cards and test yourself or study with a friend. Don’t cram! Give yourself plenty of time to study. Get plenty of sleep (9 hours every night) especially before a test! Eat a healthy breakfast that includes protein. Be sure to pack a nutritious snack and lunch or plan on buying lunch at school. Remember, food gives your brain energy to think. Take slow deep breaths whenever you feel the jitters coming on, (especially if your heart is pounding). Be sure to exhale (breathe out). Think positive thoughts. If you start to worry that you won’t do well, remind yourself that you are prepared and in control. If you feel like your test taking methods aren’t working, talk with your teacher/professor or counselor and ask for suggestions.